Day 1 Resort/Alleppey: Transfer by road this morning from your Cochin hotel to the cruise jetty (approx 11/2 hours). 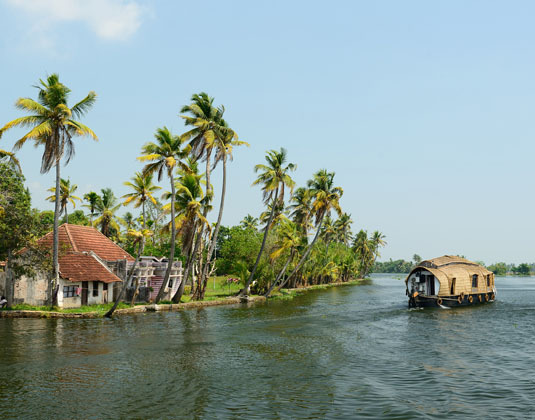 The spectacular beauty of Kerala’s backwaters needs no introduction and a fascinating cruise aboard a houseboat or ‘Kettuvallam’ is perhaps the most enchanting holiday experience in India today. Onboard there are three staff to assist you, the boat driver, your chef to prepare all of your meals and an assistant to ensure everything runs smoothly. You will depart at midday and as you enjoy lunch take in the panoramic views as you skim past water lilies, lush paddy fields, coir villages, rustic homes, temples and coconut groves. Relax during the afternoon as you continue to wind your way through the labyrinth of waterways and be sure to keep an eye out for local wildlife such as otters and turtles or birdlife such as kingfishers and terns. As the day falls away and the evening draws in your chef will prepare a delightful dinner for you using local produce. Day 2 Alleppey/Resort: After breakfast disembark and you will be transferred by road back to your chosen resort hotel. Departures: Daily from Cochin. Also available from Marari or Kovalam at a supplement. Tour price: The price shown is based on the best value travel dates in low season and includes private transfers from your chosen resort to Alleppey and one night on the houseboat on full board. The houseboat features a private room with toilet/shower facilities and viewing area at the front. No alcohol is served or provided on houseboats. Guests can take their own alcohol on board if they wish.